In the seven centuries since the death of Jelaluddin Rumi in 1273, the world has come to know and thrill to his sacred poetry. In concert with the tabla and sitar, his writing is part of a religious tradition that is believed to excite "spiritual heroism," embracing the holiness of love, lamentation, battle, and the longing for God. 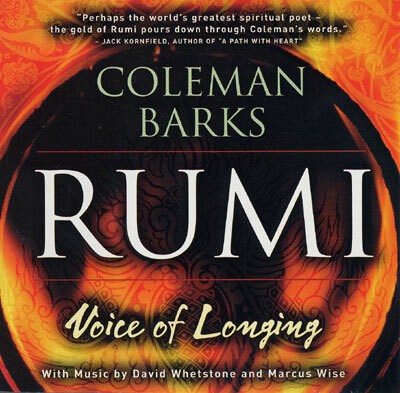 Rumi: Voice of Longing collects nearly one hundred of Rumi's most memorable quatrains, presented here on two superbly remastered CD recordings for the first time ever. Translated and performed by the Rumi scholar Coleman Barks, these works echo with a spiritual complexity that defies their outward simplicity. As Sufism acknowledges the truth of other religions, so does Rumi's poetry reflect universal themes: the search for the highest truth, the mystery of surrender, the longing to overcome ego imprisonment. Rumi: Voice of Longing captures the silence, the love, and the playfulness that make each experience with this work one of sacred wonder. With musical accompaniment by Marcus Wise on tablas and David Whetstone on sitar. Special appearance by Robert Bly.